SoulForce is a group of gay rights activists who have been traveling the country on an Equality Ride visiting different institutions that they feel have oppressive policies towards homosexuals. The 33 young adults targeted several evangelical colleges such as Wheaton, Biola, and Liberty. Well, on April 13th they visited Colorado Christian University which is about one mile from our church campus. CCU decided to use the opportunity in way that I found very commendable. They trained their students in advance, had SoulForce sign a contract, had a prayer booth on campus all day, had dialogue in several campus settings, and reached out to the riders with the love of Christ. They paired one student and one staff member with each rider. One of the ladies in my Bible Study Fellowship Class, Pam Austin, is on staff at CCU and she signed up for the job. Pam is about as warm-hearted of a Christian as you would ever want to meet. I was thrilled she would have this opportunity. After they left, our fellowship group met at Starbucks and she testified about how God used that entire experience to strengthen her faith and to give her a burden for the gay community. Pam forwarded me an email from the college administration that they sent out after the visit. Pam has acquired permission for us to post this on SharperIron. CCU took a markedly different approach to the group than other evangelical groups did. They were arrested at Liberty but ministered to at CCU. I’m curious as to what your thoughts are. CCU was visited on April 13, 2006, by a busload of Christian and non-Christian activists whose stated agenda was to confront perceived unfriendly attitudes and treatment by about twenty Christian and military colleges toward gay, lesbian, bisexual, and transgender (GLBT) people. The visit was sponsored by SoulForce and was known as the Equality Ride. It was a visit that we did not want and did not request. Theirs was an agenda that we did not agree with in the beginning or afterward. Nevertheless, we chose to treat the visit as an opportunity to represent Jesus to them as agents of both “grace and truth” (John 1.17) by engaging the visitors in dialogue in the Spirit of Christ. Our preparations for the day were extensive, including forums for students, faculty, and staff; teachings by staff from Where Grace Abounds, Exodus International, and Focus on the Family; 13 days of prayer; training sessions for student and staff hosts, who would host the Equality Riders during the entire time they were on campus; reading of Joe Dallas’ book, A Strong Delusion, and structured conversations and Q&A sessions. The day was entirely successful and encompassed many answers to our prayers. It was our prayer that no outside groups would attempt to add their own protests or create disturbances. It was our prayer that the Equality Riders would stay within the limits defined by the behavioral contract that CCU negotiated with them in advance. It was our prayer that outside media coverage would be positive and low key. All these prayers were answered. The anti-gay activists stayed away. The Riders consciously elected NOT to push the envelope of behavior. The media coverage included the Rocky Mountain. News, Denver Post, Channel 2, Channel 7, Sojourner magazine, and a radio talk-show on KHOW; but, no coverage went beyond the day of the visit itself. For local media, it was almost a non-event. It was our prayer that our students would grow in understanding of this divisive, controversial issue without being drawn into “the strong delusion.” Given the ntense preparation of our students, I concluded that none of them were drawn in by the rationalizations heard during the Riders’ presentations in a few classes. Rather, it was clear to our students that the Riders strain their own credibility by their exaggerated efforts to interpret scripture as neutral toward their sexual views. Another emphasis in Rider’s presentations was to attempt to gain sympathy for the ways in which they have suffered for their sexual orientation and to propose that homosexual and heterosexual preferences are equally acceptable alternatives. Our students were well prepared to listen in love without being misled. expressed in our policy regarding homosexuality and a testimony to GRACE expressed in how the visitors were received. (Denver, CO) - Equality Riders found smiling faces greeting them as they stepped off the bus, food and hospitality, and extensive opportunities to dialogue with students and faculty that have rivaled their most successful stops so far at Azusa Pacific, Biola University and Abilene Christian. Despite the warm welcome, the student conduct code at the school was one of the most restrictive, prohibiting “practicing, defending or advocating a homosexual lifestyle,” potentially affecting straight allies as well as GLBT people. For more on the Equality Ride stop at Colorado Christian University, see: www.equalityride.com/ccu. It was noteworthy to me that Jake Reitan, quoted above, was the most strident and zealous advocate of the viewpoint of our visitors. While the above was reported in the official press release of Equality Ride, in Jake’s closing comments at the end of the day, he spoke multiple times of the love and grace that he personally and other riders had felt during the day. He said that their time with us had been filled with real conversation and not polemic, that we had no visible agenda, and had made genuine efforts to hear him. He even became choked up as he was relaying these sentiments. Sometime along the road (before college as best I can tell), Judy rejected Christianity because he felt that Christianity had rejected him due to his controversial and confused gender identity. (This should confirm to us that he knows the truth!) In 2001, Judy went to Thailand with a friend for the operation that would solidify his decision to be a woman. Judy now embraces the precepts of many teachings including those of Jesus, Buddha, Taoism, Hinduism, and many new age beliefs. We had the opportunity to dialog about Jesus, His divinity (which she does not believe to be true), of the church, and the Bible. We quickly established our lines of disagreement, but proceeded to get to know each other in spite of those stark differences. Judy came into the day with a negative perspective of Christianity and Christians; she felt they had shown nothing but hatred and disdain for her. But Judy had not been prepared for CCU. In my own opinion, the church has done one of three things: they have erred on the side of grace, erred on the side of truth, or done nothing to respond to this issue. There must be a balance. Churches, referring to both the institutions as well as the body of believers, must provide safe places for these difficult issues such as homosexuality to be discussed; they must be addressed with the truth and love of Christ before the world begins to discuss them and define their parameters for us all. The process of preparation [for Equality Ride] taught me more about this issue than I would have ever explored on my own, and for that I am deeply grateful. In my opinion, what Satan had meant for evil, God used for good with this visit by Soul Force. I thought that Thursday went extremely well! I hosted Jacob Neal and we truly had an excellent time together. It was a blessing to be a part of this and I think that our students are better for having experienced this day. It was a wonderful opportunity to learn and be stretched and most importantly to love and speak truth. Not one minute was wasted as we experienced true dialogue throughout the entire day. We discussed everything from etiology, to counseling, to our children playing together one day. No simple answers for such a complex issue. Her questions were many and her beliefs were bold, but her ears were eager and her heart was inviting. A connection was made. She allowed to me to peer into her soul, and she courageously looked into mine, only to find that while we differ on some core beliefs, she could not deny my genuine care for who she was as a person. She left saying that she would never forget me, and I left thinking that today was nothing short of Divine. I would like to thank the many people of the CCU community who volunteered many hours in preparation, hosting, supporting and serving as exemplary disciples of our beliefs. I know that this activity presented to many of you much additional work, new challenges and unfamiliar roles. May God bless you for your representation of Jesus’ grace and truth in CCU’s response to the Equality Ride. Thanks be to God for His innumerable answers to our prayers. The Soulforce Equality Ride is a journey to change the heart and mind of America on the issue of lesbian, gay, bisexual and transgender (LGBT) equality. Following in the footsteps of the Freedom Rides of the 1960’s, the Equality Ride uses principles of non-violence to confront military and religious colleges and universities with policies banning enrollment of LGBT students. 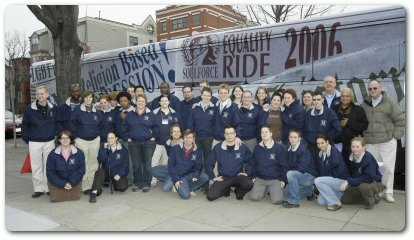 The Equality Riders reflect on the lessons of history, which have shown religion-based discrimination against women, people of color, and religious minorities to be an unacceptable abuse of the sanctity of religion. At each of the 19 schools on the 51-day bus tour, the young adult ambassadors of the Equality Ride bring this simple message to students, faculty and administrators: Learn from history, end religion-based discrimination. At military and religious colleges around the nation bans on LGBT enrollment force students into closets of fear and self-hate. These bans devalue the life of LGBT people and slam the door on academic freedom. The Equality Ride empowers young adults to challenge these college bans. Now traveling throughout the country, the Equality Ride is taking 33 young adults on a seven-week bus tour to confront colleges that ban the enrollment of LGBT students. Through dialogue with administrators, faculty and students, the young activists of the Equality Ride are making clear the harmful effects of the false notion that homosexuality is a “sickness and a sin,” and “a threat to the nation and the military.” To make public their case for equality, the young activists on the Equality Ride hold vigils, Bible studies, class discussions, community forums, and press conferences. In the process the members of Equality Ride are bringing hope and healing to lesbian, gay, bisexual and transgender students who are forced to live and suffer in closets of fear on their college campus. The Equality Riders are revealing to the public the hardship these students face and making clear the need for change. Equality Riders are empowering young activists in the schools and communities they visit, and building a national youth movement for LGBT equality.